Heat gas or charcoal grill. Spray grill basket (grill "wok") with nonstick cooking spray. In medium bowl, combine chicken strips, bell pepper and onion stir-fry and 1/4 cup fajita sauce. Place chicken mixture in sprayed basket. When grill is heated, place grill basket onto gas grill over medium heat or onto charcoal grill 4 to 6 inches from medium coals. Cover grill; cook 8 to 10 minutes or until thoroughly heated, shaking basket or stirring chicken mixture occasionally. Meanwhile, place tortillas on ungreased cookie sheets. Sprinkle with 1 1/2 cups of the cheese. 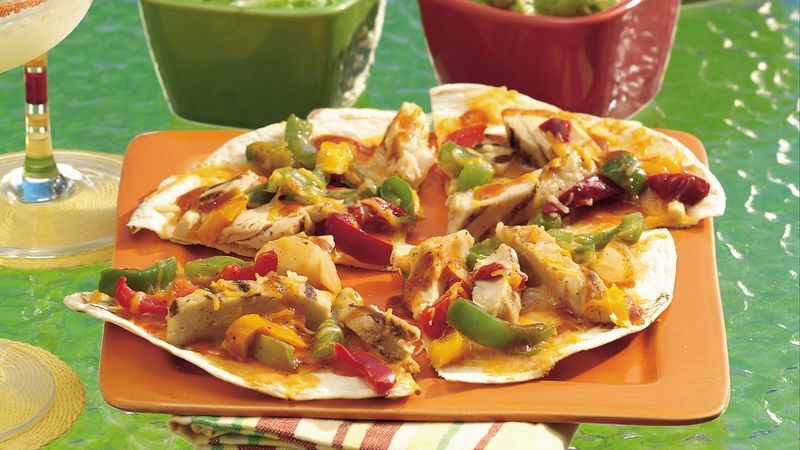 Divide grilled chicken mixture evenly onto cheese-covered tortillas. Top each with 1 tablespoon fajita sauce and 1/4 cup remaining cheese. With wide spatula, carefully slide pizzas onto grill. Cover grill; cook 3 to 6 minutes or until cheese is melted and crust is crisp, rearranging pizzas occasionally. Slide pizzas back onto cookie sheets. Cut into wedges. For variety, use strips of beef, pork or turkey instead of the chicken. Use a pizza cutter or kitchen scissors to slice or cut the pizzas into smaller sections. Have traditional fajita toppings such as sour cream, guacamole, shredded lettuce and salsa available to guests.